The International Cricket Council (ICC) have announced their annual award winners for the year 2018. The committee, comprising of members across all the countries affiliated to ICC, held a voting process to nominate the winners for different awards. Amassing 48 percent of the votes, India's U-19 World Cup victory on New Zealand soil last year has been named as ICC Fans' Moment of the Year. The Men in Blue displayed an exceptional performance throughout the tournament and emerged as winners. With 36 percent votes, Afghanistan’s stunning comeback to clinch the ICC Cricket World Cup Qualifier came as the runner-up for the ICC Fans' Moment of the Year. The twelfth edition of ICC U-19 World Cup was last year held in New Zealand. The tournament lasted from January 13 to February 3, with 16 teams taking part in it. India started the tournament on a high note as they topped the points table in the group stages before breaking into the super eights. The Prithvi Shaw-led side continued its good run in the super league as well. In the second semi-final of the tournament, the Men in Blue faced arch-rivals Pakistan. However, the match became a one-sided affair as India posted a mammoth victory by 203 runs. Lastly, the unbeaten Indian side played Australia in the final. 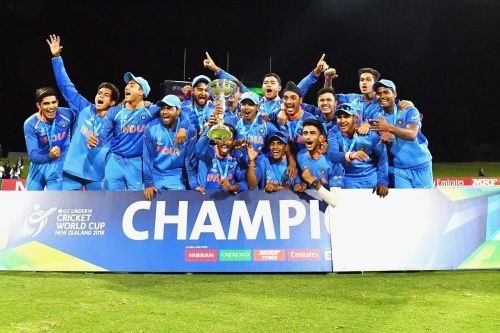 Prithvi Shaw's men maintained their consistency by winning the final by 8 wickets and lifted the U-19 World Cup trophy. The flamboyant performance by India in the U-19 World Cup eclipsed the five nominees for the Fans' Moment of the Year award by gaining a high percentage of the votes. Pakistan's surprise victory in the Champions Trophy had been named Fans' Moment of the Year for 2017. Meanwhile, the 13th edition of the ICC U-19 World Cup is scheduled to be held in South Africa from January to February 2020.